My first lesson when i begun to learn chess was: How the pieces move. My second lesson was, piece value. 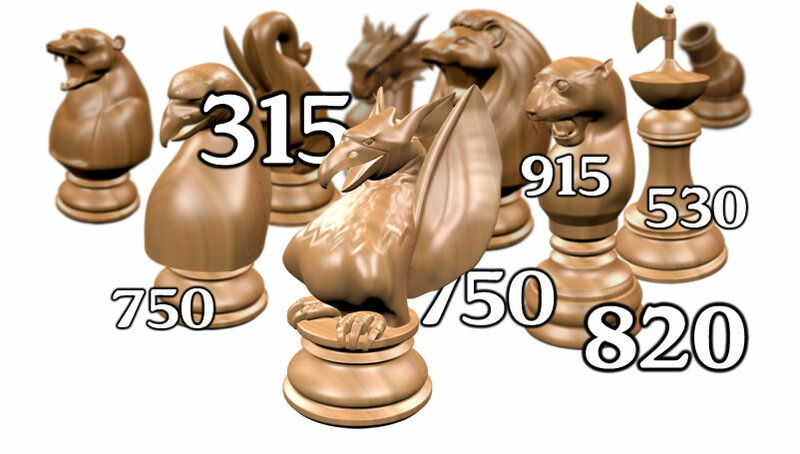 I was told that, a pawn is worth one “point”, knight and Bishop worth 3 Pawns, Rook worth 5 Pawns, Queen worth 10 Pawns. This was the first and only lesson related to piece evaluation. I then begun to play, learn books and improve my play. The more i learnt, the more i understood the beauty and complexity of chess, of chess positions, strategic and tactical finesses. And i begun to appreciate positional sacrifices etc. This section, although probably inaccurate, has the merit of giving a start for all of you who want to play Musketeer Chess. In our research trying to approach the most accurate possible relative value, we developed an engine for this purpose. This engine helped in testing various ideas and various “settings” with different relative values. The results we present here are the fruit of thousands and thousands of played games. These are the values given by GM Larry Kaufmann, in his Evaluation of Material imbalance, work based on analysing Grand Masters Millions of games and used to improve his engine Komodo. Leopard : 670, slightly stronger than Knight and Bishop combined. Even though the Bishop moves are restricted to 2 squares. Archbishop : 770, globally worth a Pawn more than the Leopard due to extended Bishop abilities. But this is subject to floating depending on the position. This floating could be worth an additional value of half or a full pawn. Cannon : 750, slightly less strong than the Archbishop. The Cannon is an excellent piece when playing the endings, especially when it is near the opponent’s king. This is one of the “surprises”: the Cannon is stronger than the Elephant. This was almost the only big difference between my “intuition” based on hundreds of my games, many hours testing On The Board and probably more accurate calculations based on thousands of games testing various settings including my assumed relative piece values. Chancellor : 800. Worth half a pawn more than the Archbishop. This is especially true in the opening and early middle game, as there are less opened files. The more the game opens, the more it becomes powerful. Chancellor can almost play equal game facing the Queen. Probably worth 925 in the endings. Dragon or Amazone : 1250 – 1400. Worth slightly less than the value of the Queen + Knight in the opening as it can easily be attacked by much less powerful pieces. In the ending it is by far the strongest piece and is worth easily the value of Queen + Knight + one or two Pawns. Unicorn : 560, worth less than two Knights. Stronger in the opening and middle game. Looses value the more pieces are traded. Hawk : 550, my favorite piece. Looses value in the ending. A Rook is probably stronger. Rook vs Hawk endings are tricky, probably one of the most tactical ending in Musketeer Chess for relatively equal strength pieces. Elephant : 630. Worth a Pawn less than the Cannon. Visually, it can seem more powerful than the Cannon because it has symmetric moves. But in reality Cannon is more valuable especially in the endings. Elephant is more useful in the first stages of the game because it has a good reach compared to the Cannon. But the Cannon is an excellent defensive and attacking piece. It’s a formidable defender and attacker at the same time, especially when it’s near the opponent’s King. Fortress : 760. Slightly inferior to the Archbishop. Spider : 815. It is the second strongest piece after the Dragon. Slightly stronger than the Archbishop. It’s main weakness is tha it can be easily attacked by nearby pieces. This particular feature gives many interesting tactical shots for both sides. We will detail how we obtained these values in a separate article. I’d like to aknowledge the article written by ‘chess.com user Ebinola’. You can read it here. It is an interesting introduction to Musketeer Chess. I’d like also to aknowledge another excellent article, with a comparable scientific methodology in assessing the relative value of the pieces. It’s the article written by Sbiis Saibian or ‘chess.com user finitus’. It is a mathematical approach to assess Musketeer Chess Piece Value . I also wellcome you to visit our youtube channel, with plenty of exciting some games of Musketeer Chess.